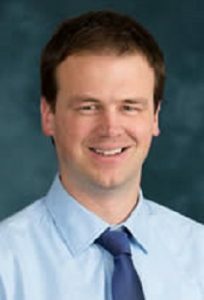 Matthew Schipper, PhD, is Assistant Professor in the Departments of Radiation Oncology and Biostatistics. He received his Ph.D. in Biostatistics from the University of Michigan in 2006. Prior to joining the Radiation Oncology department he was a Research Investigator in the Department of Radiology at the University of Michigan and a consulting statistician at Innovative Analytics. Use of Biomarkers to Individualize Treatment – Selection of dose for cancer patients treated with Radiation Therapy (RT) must balance the increased efficacy with the increased toxicity associated with higher dose. Historically, a single dose has been selected for a population of patients (e.g. all stage III NSC lung cancer). However, the availability of new biologic markers for toxicity and efficacy allow the possibility of selecting a more personalized dose. I am interested in using statistical models for toxicity and efficacy as a function of RT dose and biomarkers to select an optimal dose for an individual patient. We are studying quantitative methods based on utilities to make this efficacy/toxicity tradeoff explicit and quantitative when biomarkers for one or multiple outcomes are available. We have proposed a simulation based method for studying the likely effects of any model or marker based dose selection on both toxicity and efficacy outcomes for a population of patients. In related projects, we are studying the role of correlation between the sensitivity of a patient’ tumor and normal tissues to radiation. We are also studying how to utilize these techniques in combination with baseline and/or mid-treatment adaptive image guided RT. Early Phase Oncology Study Design – An increasingly common feature of phase I designs is the inclusion of 1 or more dose expansion cohorts (DECs) in which the MTD is first estimated using a 3+3 or other Phase I design and then a fixed number (often 10-20 in 1-10 cohorts) of patients are treated at the dose initially estimated to be the MTD. Such an approach has not been studied statistically or compared to alternative designs. We have shown that a CRM design, in which the dose-assignment mechanism is kept active for all patients, more accurately identifies the MTD and protects the safety of trial patients than a similarly sized DEC trial. It also meets the objective of treating 15 or more patients at the final estimated MTD. A follow-up paper evaluating the role of DECs with a focus on efficacy estimation is in press at Annals of Oncology.